When Debbie and I were engaged, her family began to include me in their outings. Any trip to a restaurant was preceded by a long, inconclusive discussion of possible places to go. This was something unusual for me. I suppose there weren’t many choices open to me while growing up, but even when that changed my approach tended to be: just pick something. Considering the options was something I never enjoyed. 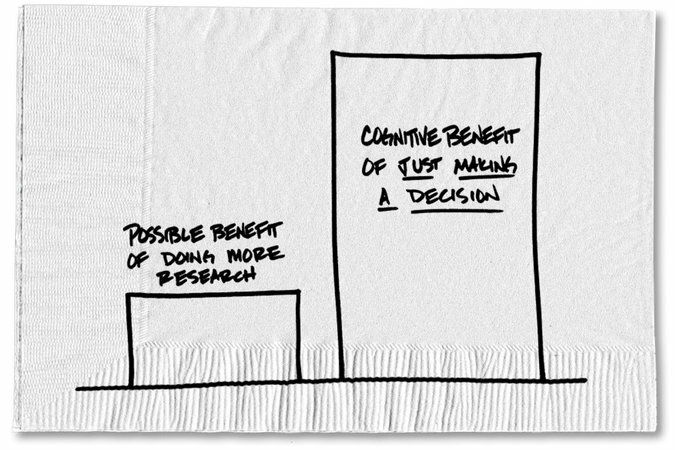 It’s a simple point, but the simple ones bear repeating: the increment between the good choice you can make right away and the better one you might possibly make after considering it further is often outweighed by the cost of considering—cost in time, in anguish, and in delaying the benefit of having the thing. As I drove home, I realized how refreshingly different this experience had been. My normal pattern when it comes to spending money is to look at every option. I read reviews, study alternatives and ultimately spend way too much time finding a way to save a bit of money. I go through this process even when I have already decided I’ll make the purchase. I’m also very aware that the time I spend overanalyzing prices will cost me way more money, in the form of opportunity costs and cognitive drain, than I could ever hope to save. On top of all that, it’s painful. I did the opposite with the boot heaters. I decided that if my wife was going to enjoy skiing, she needed (yes, needed) boot heaters. I had the money, so I bought them. It was such a relief to make a decision without weighing 50 options, reading hundreds of testimonials or calling friends for recommendations. I knew what I wanted, and previous experience with the local shop gave me the confidence to trust I had made a good decision. Not the best decision, just a good one. Contentment has its rewards.